The company burned through more than $1 billion in the first quarter of 2018, ending the quarter with less than $2.7 billion in the bank. Tesla likely has even less than that today. Adding to the pressure is Tesla's massive debt; more than $10 billion in total debt, and more than $1 billion of that could come due in the next eight months. The big question is whether Tesla can achieve positive cashflow before it runs out of money—or if not, whether it will be able to raise additional funds to cover the shortfall. Tesla is 15 years old, but it's still fundamentally a startup. And being a startup in the capital-intensive car business means raising billions of dollars to spend on manufacturing infrastructure. 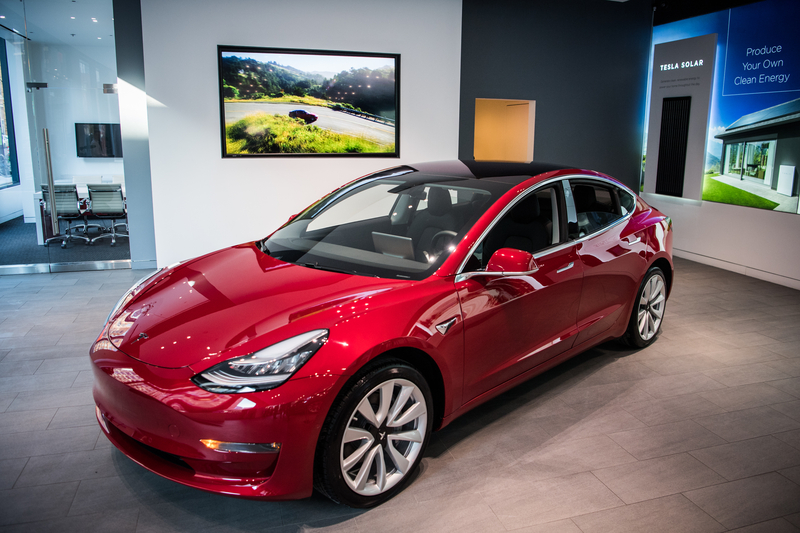 In recent months, as Tesla races toward volume production of its mass-market Model 3 sedan, some analysts have warned that Tesla could be months away from running out of cash. The company burned through more than $1 billion in the first quarter of 2018, ending the quarter with less than $2.7 billion in the bank. Tesla likely has even less than that today. Adding to the pressure is Tesla's massive debt. Tesla has more than $10 billion in total debt, and more than $1 billion of that could come due in the next eight months. In recent months, Tesla has taken a series of measures to shore up its financial position. Tesla laid off about nine percent of its workforce last month in a major cost-cutting step. Tesla also opened up Model 3 orders to everyone in the US and Canada. Placing an order requires a $2,500 deposit, which will give the company an additional cash infusion. The Wall Street Journal reported that Tesla was pressuring suppliers for more favorable financial terms—including, in at least one case, partial retroactive refunds of past payments. According to the Journal, a memo to one supplier "described the request as essential to Tesla’s continued operation." Asked about this, a Tesla spokesperson told Ars that the company has "asked fewer than 10 suppliers for a reduction in total capex project spending for long-term projects that began in 2016 but are still not complete." Tesla says that with other suppliers, it has only asked for lower prices for future orders. The most important thing that will—hopefully—reduce Tesla's cash burn rate is achieving volume production of its Model 3 vehicles. Work on the Model 3 assembly line should be winding down—reducing capital spending—while increased production of Model 3 cars should mean more money coming in from customers. Tesla CEO Elon Musk tweeted in April that Tesla will achieve positive cash flow and profits in the third and fourth quarters of 2018. That claim has attracted a lot of skepticism from Wall Street, but there's good reason to think that Tesla's financial situation will at least improve in the next few months. After all, Tesla has been through all of this before. Tesla suffered dramatically negative cash flow before launching each of its previous two vehicles—the Model S and the Model X. The scale of the losses is bigger this time because the Model 3 is a much higher-volume product. But fundamentally, Tesla is trying to follow the same successful script it followed with previous car launches. Free cash flow isn't the same as profit. 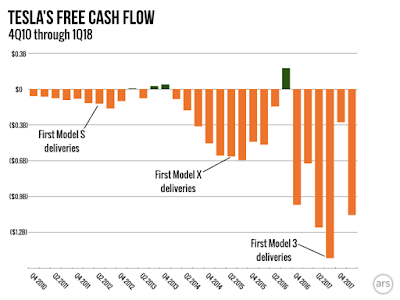 If Tesla spends $1 million for a piece of equipment, accountants will subtract that full amount from free cash flow in the current quarter. By contrast, when computing profit, accountants will treat it as an asset that depreciates over several years. This means that the more heavily a company is investing, the worse its free cash flow will look—even if those investments ultimately turn out to be highly profitable. 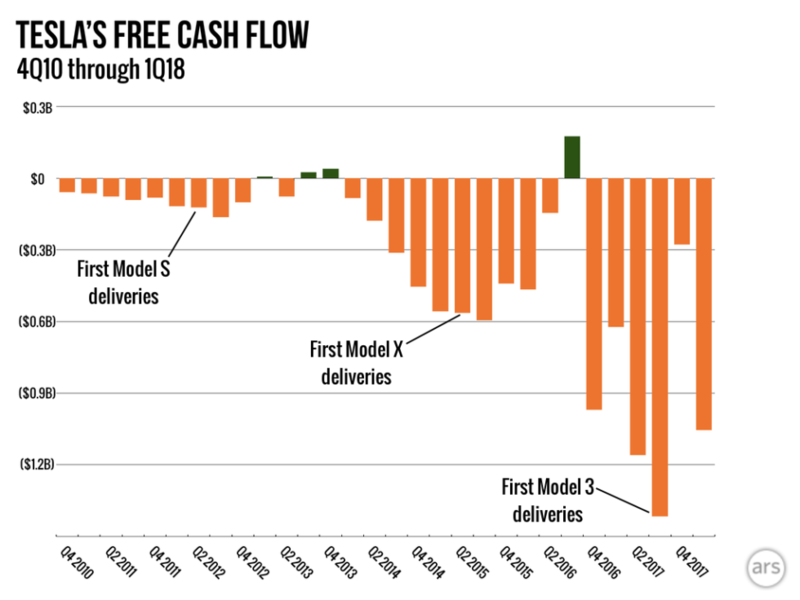 Manufacturing cars requires a lot of big, expensive investments, so it's no surprise that Tesla has had dramatically negative cash flow for most of its 15-year existence. That negative cash flow has required Tesla to raise billions of dollars from investors and lenders. And as this chart shows, there's a clear pattern to Tesla's free cash flow. As the company nears the release of a new car—first the Model S, then the Model X, and now the Model 3—cash flow losses soar. But then about a year later, cars start coming off the assembly line in significant volume, generating revenue that offsets the manufacturing expenses and turning free cash flow positive—at least briefly. For example, Tesla enjoyed modestly positive free cash flow in the third and fourth quarters of 2013. Tesla probably could have continued enjoying positive cash flow into 2014 if it hadn't begun work on the Model X. The magnitude of negative cash flow has been much bigger for the Model 3 than for earlier cars because the Model 3 is a bigger, more ambitious project. Higher-volume assembly requires more investment in equipment and hiring more people to work the assembly line. But there's every reason to expect the same basic pattern to repeat—with cash flow turning positive some time soon—maybe even in the current quarter. The big question is whether Tesla can achieve positive cashflow before it runs out of money—or if not, whether it will be able to raise additional funds to cover the shortfall. As we noted above, Tesla had $2.7 billion in cash on hand at the end of the first quarter of 2018. Tesla burned through $3.4 billion in 2017 and more than $1 billion in the first quarter of 2018. If that burn rate were to continue, Tesla would need to raise more money before the end of the year. But as we've seen, we can expect Tesla's burn rate to start improving soon, as Tesla finally reaps significant revenues from sales of new vehicles. Still, even with that additional revenue, things are going to be tight. Tesla likely burned through significant cash in the second quarter—again, we'll find out how much next week. Tesla will need to pay off a $230 million convertible loan in November unless Tesla's stock rises to $560.64 (in which case the debt would convert to Tesla stock). Then Tesla will owe $920 million on another convertible loan unless the stock price is above $359.87. Currently Tesla stock is trading a bit over $300. Tesla also faces some other headwinds. Some reports also suggest that Tesla has work to do building out its infrastructure for servicing vehicles once they've been sold. Tesla has historically relied on selling zero-emission vehicle credits to other carmakers, but with electric cars becoming more common the value of these credits is expected to fall. Tesla's customers will also lose access to a generous federal tax credit next year, which might undercut demand for Tesla's cars. The obvious solution is to raise additional funds, either by taking out loans or by selling shares on Wall Street. Enlarge / For Tesla, a successful Model 3 could go a long way toward easing its financial concerns (here's the car on display at the Tesla Store in Washington, DC). But getting additional loans could be difficult—or at least expensive. Tesla already has a lot of debt, and creditors may be reluctant to lend Tesla even more. The bond rating agency Moody's downgraded Tesla's debt back in March, causing Tesla's outstanding bonds to trade well below face value. And there are other signs that investors are getting nervous about Tesla's debt. The cost of credit default swaps—essentially, insurance policies against a default on Tesla debt—has been rising in recent days, suggesting investors are worried that Tesla might be a bad credit risk. At a minimum, this means that if Tesla borrowed additional money it would have to pay a significantly higher interest rate. And the longer Tesla waits, the more difficult it could become for Tesla to borrow significant sums. The other option is to sell more stock. While bond markets seem worried about Tesla, stock traders still seem fairly bullish. Markets value Tesla at around $50 billion, so the company should be able to raise $1 billion if it expands its outstanding stock by two percent. That would give Tesla a nice cash cushion and reassure everyone involved about Tesla's solvency. Musk has said he has no plans to raise more money. Tesla's critics have suggested that the company is avoiding raising money from Wall Street because doing so would trigger legal disclosure requirements that could force Tesla to reveal embarrassing information to shareholders. There are a variety of rumors swirling around Twitter about what kind of information Tesla might be forced to disclose, but we haven't been able to confirm any of them, so we're not going to repeat any of that here. Another possibility is that Musk just honestly believes it's unnecessary. Musk is Tesla's biggest shareholder, and he bought still more Tesla stock just last month. Selling stock would mean diluting the profits of existing shareholders—including Musk himself—and he may simply not see a need to do that. The larger question for both shareholders and lenders is whether Tesla is on track to ultimately be a profitable company. If people have confidence in Tesla's long-term vision, it won't be hard to find people willing to provide the company with the capital it needs to cover its short-term expenses. On the other hand, if people start to doubt Tesla's long-term prospects, that can become a self-fulfilling prophecy, as liquidity constraints make it harder for Tesla to execute in the short run. This means the next few months will be critical for the company. If Tesla exceeds expectations, its cash flow problems should quickly ease and it can focus on growth once again. Conversely, if investors lose faith in Tesla, that could threaten Tesla's ability to raise more capital, posing an existential threat to the company. We'll find out how much of the company's $2.7 billion cash pile Tesla burned through between April and June as it scrambled to hit the target of producing 5,000 cars per week. And we'll learn how profitable the Model 3 has been—which will provide a clue about how much higher Model 3 production will improve Tesla's financial situation.